The lovely Jackie from Good Kitty, Bad Cat recently asked me to be a part of her handmade Christmas Decoration competition. So a group of us have been creating a little Christmas bauble to give away to our likers and followers as a way of saying thank you for your support throughout the year. I just wanted to share my little creation with you here. 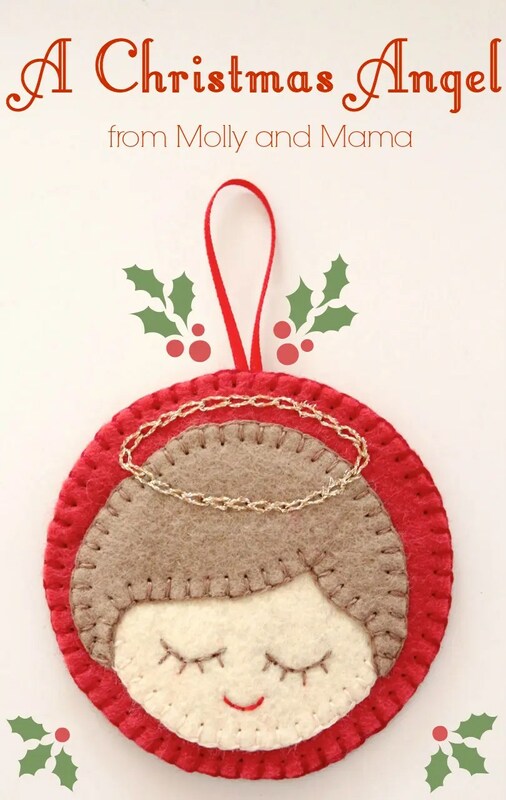 This sweet smiling angel is made of wool felt, and is completely hand stitched. I made the front first and appliquéd the face to a felt circle. I used two strands of DMC floss to back stitch the facial features, chain stitch to do the halo (with metallic thread) and blanket stitch for the appliqué. Using another felt circle the same size, I put the two circles together and joined them with blanket stitch too. A very narrow satin ribbon loop was added while I was stitching. I was really happy with how she turned out. What do you think? I have more plans to create a cute little collection of felt ornaments. You might also like this tutorial for the Felt Christmas mouse and stocking. There’s also some more great Christmas sewing and craft ideas HERE and HERE. What will you be sewing for Christmas? I’d love to see! How sweet and precious your angel and mouse are! Great tutorial and love the photos. Awesome job! Thank you so much for taking the time to leave such lovely feedback. Happy sewing!